Caribbean Commerce Magazine is a business-focused magazine that provides information on Caribbean business opportunities that stimulate growth in established and emerging Caribbean markets. Global investors and buyers will find the information in Caribbean Commerce Magazine extremely valuable. Having recently launched on Android, the tablet edition can now be found in iTunes as well as Google Play. 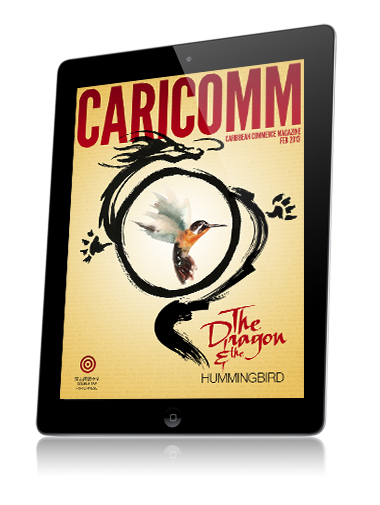 CariComm has published a digital magazine that combines business savvy with beautiful design and functionality. Created on the mag+ platform, this digital magazine takes advantage of some fantastic features – starting with the cover of the March issue. The feature piece of this issue is called The Dragon and the Hummingbird – an article that discusses Chinese investment in the Caribbean. Not only does the cover include a beautiful illustration, it also includes a well-designed double tap feature that changes the language displayed. The user can double tap to go from English to Chinese. After leaving the cover and scrolling through the issue, on page five you come to the feature article. Here users will experience a fascinating read while scrolling through the vertical pages. At any point, the user can double tap the device to switch the language from English to Chinese. The transition is stunning. The CariComm March issue includes scrolling A-layer, which is highlighted in the Black Future Month editorial as well as Anthony’s Digital Lowdown article. With this feature, CariComm uses striking photography as the background B-layer image and transitions into the story by allowing the user to drag the A-layer text over the image. This gives their tablet readers a smooth and engaging user experience. Finally, you can’t have a magazine about the Caribbean and not include Caribbean music! CariComm does not disappoint. Of Things Foretold, an interview with up-and-coming artist Prophecy, includes questions about the artist’s career, inspiration and more. The interview also integrates tap-and-listen audio clips so the readers can actually listen to the music. Check out the highlights video for more on CariComm, and download the app today!